WOMEN IN MUSIC - WHY HAVEN'T I BEEN LISTENING? We're three weeks into 2018 and I am only now getting back into blogging. I've been dabbling in a few things, in particular, I have been working on my final year project - which is centred around feminism. This led to me thinking about the talented women in the music industry and I found myself looking through my playlists to see which female musicians I listened to. I was really frustrated at how tiny the number of women that were in my music playlists was. I would go so far to say that ninety percent of my songs were created by men. Now, I am wondering is it because it just so happens that I gravitate towards male musicians rather than female, or is it a situation where women in music don't get the same airplay or support that they should? That's a topic for another day. So I began to work on a playlist of female-oriented songs, whether that be bands with a female lead, female singer-songwriters or even just a song with a female voice in it. At the moment I am struggling to find songs I like and again, I don't know why exactly that is. 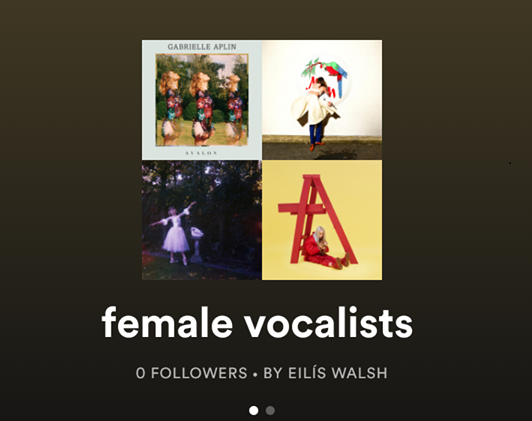 I've decided to list some of the songs I have been liking out of this playlist and it's my hope that this post will encourage you to seek out female musicians and give their brilliant work a chance. I will admit that I have been really into electronic music lately so you'll notice that a lot of the songs have an electronic element. I will try to add more folk/pop etc as time goes on so keep an eye on the playlist. I also need to delve into the world of Ireland's female musicians more. Who knows, if this post goes down well I will do more posts like these in the future. Click the picture below if you want to trawl through my playlist and feel free to suggest songs to me, I'm all ears! Where to begin with this? I've gotten really into American duo Sylvan Esso in recent months. The combination of Amela Meath's beautiful voice and the production of Nick Sanborn creates such gorgeous synth-pop. This song immediately made me sit up and listen, it's so groovy. Keep an ear out for the rising chorus. I was listening to this song absentmindedly when the beautiful piano caught my attention around the two-minute mark. The voices of Josephine Vander Gucht and Anthony West harmonize perfectly and it's a really cheerful alt-pop song. Again, it was the piano that I thought was lovely as the song rises to a climax. Made up of Australian duo David Ansari and vocalist Parissa Tosif, Vallis Alps was a welcome find. I listen to a lot of this chilled music so it was refreshing to escape from the likes of Four Tet and Bonobo for a song with a female voice. I think it's a song you can both dance to and relax to. Parissa's vocals are heavenly. This song is one of those songs that will have you screaming out the lyrics too. Wolf Alice are a band I've loved for a long time now, a huge reason being that this fantastic band has a killer female vocalist. Ellie Roswell's voice is oddly soothing - I can play this song over and over without getting bored and I think that's the sign of a good song. I knew when I heard this song first that I had heard the lyrics before. As it happens, it's a cover of The 1975's song of the name. Vérité adds her own synthy twist to the song and makes it happier. I particularly like the chorus, it's one that'll make you sway along to it. Every time I listen to this girl I am amazed. California native Billie Eilish is FIFTEEN years old. I couldn't believe it. Her vocals are breathy yet powerful and she sings the song her brother wrote so beautifully. She is definitely one to watch. There is also a dance performance video to accompany the song, in which Billie dances herself. I will totally admit that I am definitely jealous of this girl's abilities. A list of mine containing female musicians would not be complete without British musician Gabrielle Aplin. Gabrielle has such a gorgeous, ethereal voice and I have really enjoyed listening to her transition from an acoustic sound to a more electronic sounding one. The great thing about Aplin is that she sounds the exact same singing live. I love the production on this song. CHVRCHES never fail to get me moving. Probably the move synthy song of this list but I love it. Lauren Mayberry's Scottish accent is really endearing. It's a very anthemic song, I always come away from listening to their music feeling happier or at the very least uplifted. Most certainly a song to dance to. I have always admired Lorde's in-depth discussions about her music, especially her process. 'Hard Feelings' has sentimental value to me, I think everyone knows what it's like when they are disappointed in love. I love Ella's vocals, she is such a unique and interesting individual that I am always excited when she brings out a new single or collaboration. The transition between 'Hard Feelings' and 'Loveless' is so smooth, yet the two songs oddly fit together. And she's from New Zealand, a place that's definitely on my bucket list to visit. Found this song in Lorde's 'Homemade Dynamite' playlist, something she curates herself and adds songs she likes. I'll admit that the singer's voice is something I need to get used to, but I think the instrumentals are really cheerful and I am really into that sort of sound. We need more female lead singers! As I mentioned in the beginning of this post, I found locating songs and actually liking them, more difficult than usual. If you have opinions on why you might listen to male musicians rather than female musicians, be sure and send me a message. Or leave a comment! Writing this post was a challenge, but a welcome one at that!